The Manchester Township Police Department is proud to announce the graduation of Ptl. 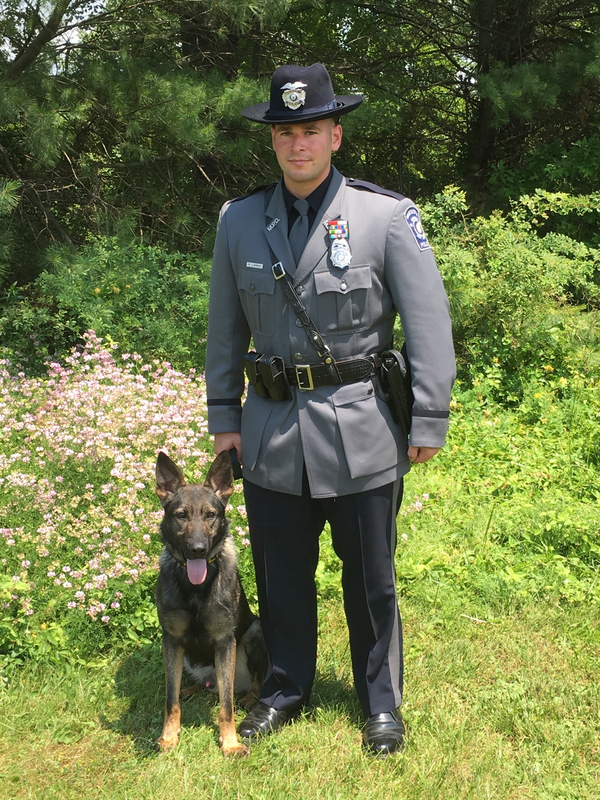 Steven Wendruff and his canine partner Lynk from the New Jersey State Police Scent Class #31 on June 17, 2016. Ptl. 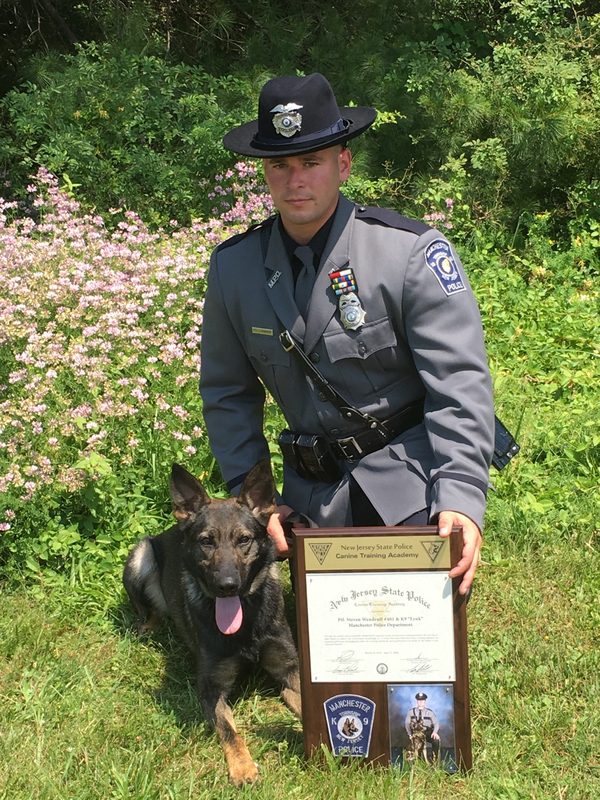 Wendruff and K-9 Lynk were one of four Officer/K-9 teams to graduate from the intensive Narcotics Detection training course, which began on March 14. They were presented with a certificate during the graduation ceremony at the New Jersey State Police Forensic Technology Center in Hamilton. Police K-9s were trained in the detection of six types of controlled dangerous substances which included: marijuana, cocaine, crack cocaine, heroin, methamphetamine and ecstasy. The other team in Manchester’s K-9 Unit, is Ptl. 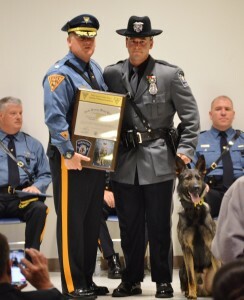 Marc Micciulla and his K-9 partner Storm. This K9 team successfully Patrol training in June of 2015 and completed scent detection training in January of 2016. K-9s Storm and Lynk are Dual Purpose dogs, meaning they are trained in the areas of police patrol operations, such as tracking and locating missing persons, suspects and evidence, as well as in narcotics detection. 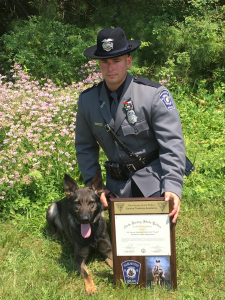 Both Storm and Lynk were purchased at no cost to Manchester Township Taxpayers, as they were purchased using money from Manchester’s Law Enforcement Trust Account, which is comprised of revenue generated from seized and forfeited assets. Any residents interested in assisting our K-9 Unit may do so through a donation to the Manchester Township Police Foundation by clicking the “Police Foundation” tab on our website, www.ManchesterPoliceNJ.com. 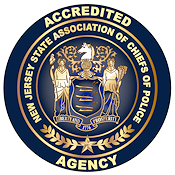 A video replay of the proceedings, supplied by the New Jersey State Police, was shared to our Department’s Facebook page and may be viewed at www.Facebook.com/ManchesterPolice.